Just replied to the email. Sorry to hear that you are out of stock. I didn't take part in the survery because I didn't return any product. A few months ago, I bought many Nepton 140XL and 280L coolers meant for high-end Z97 workstation builds used for Scientific and Engineering applications. Those coolers work great when it comes to keeping temperatures to minimum. Main issue: stock fan noise at high-loads in lab environment. This results in distraction and annoyance to my employees. Nevertheless, it's really worth not to look at that additional spending. Could someone help on suggesting alternative fan models from Cougar, Noctua, Bitfenix or Scythe or whichever quiestest model? Note: I hope this fan noise issue doesn't exist in the latest 120XL and 240M Neptons. I'll be building 6 more machines during the holiday season. For the quietest fans, look into the "Silencio" brand. They use liquid bearings, and they are extremely quiet, BUT, they do not have the 4-pin wiring(4th pin is for speed control of the fan. ), but, they are still very quiet, and work great! I have returned my Seidon 240M radiator and pump, since they stopped working(Not exactly sure if it is a leak or just the pump failed, or what it is, could be both. ), and I am now hearing, that they cannot even refurbish the stuff, that I returned to them, or send me a small upgrade to what I had, that failed, like that "MasterLiquid Pro 240 All-In-One (AIO) Liquid Cooler With FlowOp Technology, Dual Chamber Design And MasterFan Pro Radiator Fans By Cooler Master", I didn't pay much different, then what these are going for, and it is same size, as to what I basically had, so, it would basically be an upgrade, from the flawed parts, that I paid to send in to the company, to have them either repaired or send either a new or refurbished parts, that worked. 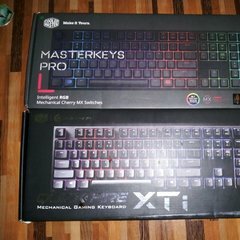 In my opinion, they should send those of us, who had the similar stuff(As in, the 120 sets, should send the 120 version of the "MasterPro", and same with the 240's. ), so that we can go back to our everyday things, and stop losing money, that we already spent, on something else, that we relied on the cooling devices, to keep our gaming rigs cool enough to not over-heat, and etc. Seeing as, with everyday, that passes, that is just more cash down the drain, and at least could have let us know, of the warehouses out of any of the liquid coolers, and all that! I am NOT impressed with this issue, right now! I also got an e-mail, from the US CM people, saying, that I have to send in my "Pay-Pal account name, and etc, and the same exact receipt, that I already sent in, to get a complete refund! Problem is, since I do not trust Pay-Pal, since my account was one of the thousands, that got hacked, I closed it down, and never opened another up, so, where does it leave us, who do not trust the "Pay-Pal" people!? Unfortunately Cooler Master has had to deal with a situation concerning a trademark issue which is why we cannot get resolution unless they offer some other settlement to the best of my knowledge. More in depth information can be had by searching for the issue online. Cooler Master makes good gear and I do not know the details but it is unfortunate. When are you going to send the replacement or at least a status update? Have you checked all the options under your rma ticket submission? sometimes when they respond it is in a different subsection of the rma return options after you log in. RMA ticket; open case; etc. it is not exactly user friendly you have to dig to find the supplemental comments. Owned my Nepton 240 for almost 2 years, Then one day it failed, ever boot after that, the system just threw a CPU Fan failure error and shut down. Never experienced a leak not even a drop. Anxiously awaiting the return of the cooler. Yes I would buy another. I had to return mine because it was the older model not the newer model with the sleeved hoses and despite some attempts made by Cooler Master and the retailer to find out what stock type they had, I ended up getting the older model, which was promptly resolved by the Cooler Master team ( Rudd Jacobs ) and the result is a extremely happy and now firmly loyal, who has no qualms about shouting from the mountain tops that Cooler master's are the best.